Efficient cooking and mashing is all about temperature management. In this iStill Blog post I will tell you how you can do it in an energy efficient and quick way. First, by diving into how mashing is normally done, then by introducing new procedures that will get you there faster and at lower costs. Okay, envision you are going to mash 2000 liters of corn whiskey or Bourbon beer. Let’s assume you will use 400 kilo’s of grains and 1600 liters of water, and you aim for a distillers beer that will reach 8% after fermentation. There is 300 kilo’s of corn and 100 kilo’s of malted barley in this example. Cool to 20 C and start fermentation. So … what’s wrong with that? I’ll tell you what’s wrong with that. I don’t like the idea of heating up and then cooling down some 2000 liters. It takes up a lot of energy as well as time. With iStill equipment you can now do a better job at a faster speed and with less money down the drain. How? Let’s dive in deeper. The iStill Masher has a double boiler design as well as a bottom dweller agitator. The jacket, filled with a special synthetic oil, allows our masher to work with increadibly thick mashes. Thick mashes as in … 400 kilo’s of grain and just 800 liters of water. And then cool to 20 C using the remaining 400 liters of water and start fermentation. Because the iStill Masher can cope with increadible thick mashes, we only need to bring 800 liters of water to a boil instead of 1600 liters. Bingo! We just saved 50% on our energy bill and cut the heat-up time by half! And since we do not need all the water for cooking … we can actually use it for cooling. By adding 400 liters of cold water to the iStill Masher, when cooking is done, we reach starch conversion temperatures without having to waste more time and/or cooling water. When conversion is done, we can now use the last 400 liters of cold water to further cool down the mash to fermenting temperatures. Another time and money saver! And there is more efficiency to be found! In the old style cooking and mashing procedure, we cool to 20 degrees C. Probably even to 16, 17 or 18 C. The reason to cool this far down has to do with fermentations creating a lot of heat. A lower so-called yeast pitching temperature, means it takes a while before the temperature of the fermentation reaches the critical temperature of 35 C (this is when most yeast starts to die). 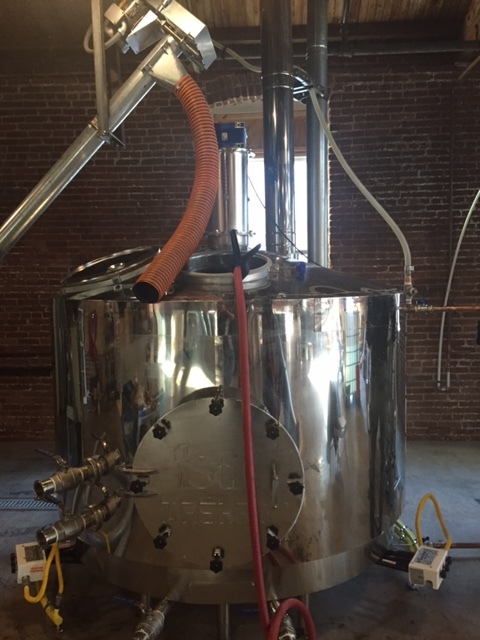 But with the iStill Fermenter, we offer temperature controlled fermentation. The iStill Fermenter allows you to ferment at preset temperatures and actively cools the ferment to keep those temperatures within range. This means that there is no need to cool the mash to 16, 17, 18, 19 or 20 degrees C. You only need to cool it to around 30 degrees, which will save you yet more time and more money. If you use the agitated and doube jacketed iStill Masher you can save hugely on mash time and mash money. By adding a temperature controled iStill Fermenter, more gains can be found. The iStill Water Cooker can help you lower your total operation cost and time even further. The iStill Water Cooker is a 3000 liter unit. You can use it to store cooling water. Say you run an iStill 250. It uses around 1500 liters of cooling water during a run. And that cooling water comes off the still pretty warm. By adding it to the iStill Water Cooker, you can preserve the temperature for later mashing. The higher temperature of the mash water will further shorten your mash time. And if you use the iStill Water Cooker to bring 800 liters of water to a boil, you can gain more time on masing. No more heat-up time prior to boiling!